What happens when stereotypes, fueled by popular culture, creep into a retailer's business decisions? Fresh Produce is a women’s clothing brand with a devoted base of shoppers who enthusiastically embrace the relaxed fit and bright coastal motifs of its casual wear. 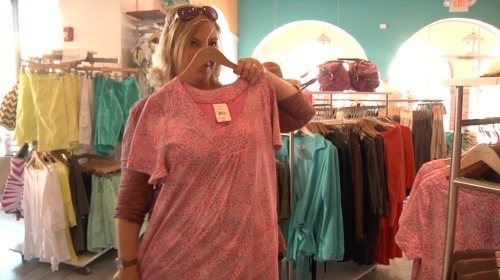 A modest revenue stream was coming from a handful of styles produced in Plus sizes that were haphazardly available in the back of the store (next to Clearance) or online. Based on the expense of maintaining this random Plus inventory in the stores, the CEO decided to migrate their Plus items to be exclusively online. “She’s not our core customer” and “her clothes cost more to make” became the rationale when this move was announced at a national meeting. This announcement was met with such a unanimous outrage from store staff that the founder pressed pause. Why were the managers so upset? What connection existed between the Plus shopper and the brand? What drives Plus shopping behavior? We investigated the actual Plus fashion offering in the marketplace; conducted social listening on the cultural conversation around obesity; familiarized ourselves with the emerging feminist Body Positive movement (BoPo). Unsurprisingly, we came across all manner of cultural bias, fat-shaming, and stereotypes of Plus women as sloppy under-achievers. This represents a cultural tension which is at odds with the hard data of obesity in America. Primary research methodology included videotaped in-depth interviews with Plus customers in three markets, a Plus blogger, a BoPo activist, and a designer of bespoke Plus garments. Participants completed workbooks and were given promotional codes to have an online shopping experience in advance. Interviews were conducted in-home and included projective exercises and stimulus. Additionally, we videotaped Shop-alongs at Fresh Produce stores. We analyzed over 40 hours of video, conducted over 15 hours of store observation, and coded 28 workbooks. A collage of media messages that Plus size women “call BS on”. The Plus shopper is keenly aware of the assumptions made about her lifestyle and the media inferences that “fat girls” are unhappy and ashamed of their body. The weight loss industry is a key culprit in painting Plus as a market that is in flux – women who will start spending on fashionable clothing once they lose weight. Consequently, a very limited supply of fashionable Plus clothing is even manufactured. Plus women must often settle for baggy “mumus”. The misperception that she wants to hide her body “under a tent” feeds the cycle of stereotyping. The quintessential “MuMu” for Plus sized women is shapeless, boxy, and an outdated floral print. There is a literal dearth of selection for her; she is forced to buy what is available versus what she actually finds cute. Further, her clothes are often made of cheaper fabric and shapeless patterns. Plus models are either thin women in too large garments or big women in “apologetic” poses. Plus women feel marginalized by society and see the current tropes of the fashion industry as a way “the man” is keeping her down. Her antenna is always up for anything that signals inclusion; the sense of belonging that comes from dressing in style and looking put together. Elizabeth Albert: business owner, fashion designer, Body Positive activist. Elizabeth designs and sells bespoke Plus fashion at CandyStrike. A participant from our study. Our recommendations were applied across the entire organization. As a test, designers re-cut eight popular items for the Plus shape. Parity fabric was sourced. A true Plus model was used and wore the appropriate size. Store personnel were trained to guide toward figure-flattering fits. In-store, Plus clothing was merchandised alongside regular sizes. Marketing included the Plus model in active lifestyle scenes integrated with traditional models. Our recommendations were applied to every phase from pattern design to merchandising. In just 60 days, sales of the test garments were up 200%. Overall Plus sales are up 9% YTD. A CEO that was going to scale back the offering is doubling down on his investment in the Plus shopper and integrating Plus throughout the entire store. Prevailing stereotypes, reinforced by popular culture, can blind a brand to real market opportunity. Today not only has Fresh Produce discovered an underserved woman with money to spend, the brand enjoys a halo of progressive relevance through size diversity.